For the summary, click here. Shin Woon is doing.. NOTHING. He is sitting/standing there seeing his master in this monstrous form and to only be able to ask ‘why, why, why’. 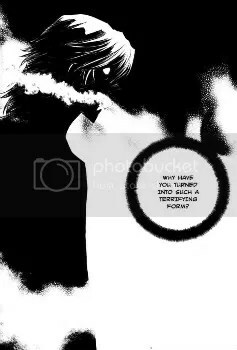 My thought as I read this chapter [or what I want to say to Shin Woon]: Why do you keep asking why? If you want to know the cause for such a form, then stop your master and directly ask him. If you don’t like your master’s current form, then change it. Return Chun Woo to the way he was when he was your master if you have a problem with how he is right now. I spent my entire day to marathon the series until I could catch up to the most recent chapter, 64. I’ve looked around and seeing people claim that this series is a rip of off GTO/HSDK [History’s Strongest Disciple Kenichi]. All I can say is that this series may be similar to GTO/HSDK but in no way does it rip off the other series that share similar genres. 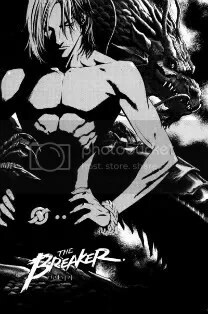 The teachers of GTO and The Breaker are both badasses; however, the teacher in The Breaker is no ordinary teacher as he instills fear in those of the martial arts world as the Goomoonryong, or nine arts dragon. The art of this series is absolutely amazing and breathtaking especially during the fighting scenes–seriously, no lie. Look below for some examples of the amazing art. The art somewhat reminds me of HSDK.